Preheat oven to 400 degrees. Peel potatoes and halve lengthwise; slice crosswise 1/2 inch thick. 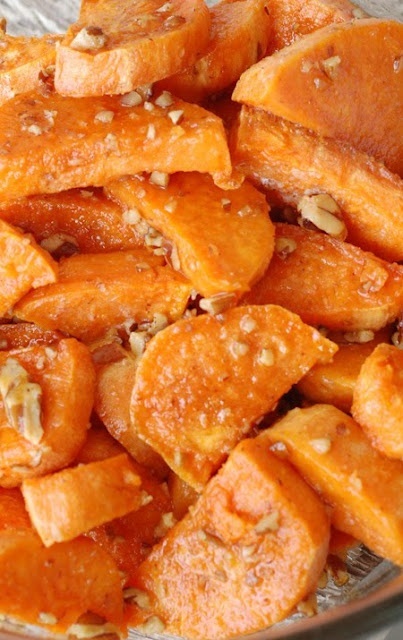 On a baking sheet, toss potatoes with olive oil (we brush it on both sides); season with salt. Transfer half the potatoes to a second baking sheet; cook both sheets until potatoes are tender, tossing occasionally, 25-30 minutes. Sprinkle with butter, brown sugar, pecan pieces and cayenne pepper, dividing evenly. Bake until sugar is carmelized and hard, about 10 minutes. Toss gently; serve immediately. Serves 8.